Many industrial applications require the use of safety sensors with high functional and performance reserves, to remain flexible with system-related conversions, for example. The SLS 46B Single Light Beam Safety Device offers sufficient functional reserves for numerous application variations, and with the particularly strong red light payload signal it can enable ranges of up to 40 m. The visible red light makes aligning so much easier. The SAT-5 alignment aid also provides an innovative alignment tool, especially for big ranges. The SAT-5 uses the sensor beam for aligning. With the solid plastic housing with IP 67 protection rating, it is highly recommended for a wide range of industrial applications as a flexible and economical solution. Together with a Test Monitoring Unit such as TNT 35 or an MSI Safety Interface, for example, the SLSR 46B forms a type 2 active opto-electronic protective device. 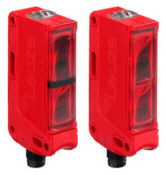 Purchase your Leuze SLSR 46B Single Light Beam Safety Devices today!